The mullen mouth design from Lorina eliminates the nutcracker effect, whilst the curved shape of the mouthpiece gives adequate space for the tongue. 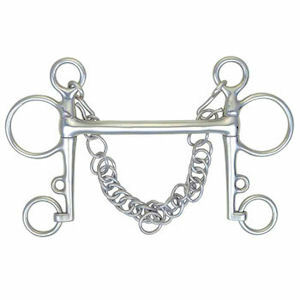 Despite this great deal of comfort, the Mullen Mouth Pelham Bit gives excellent control over the horse, and remains a strong bit. There are currently no questions for JHL Mullen Mouth Pelham - be the first to ask one!